(PARENTAL ASSISTANCE AND SUPERVISION REQUIRED) Any of these make attractive holders to show off either homemade or commercial candles. Decide first what sort and size of candle is to be used in the holder, so that the two are a pleasing combination. (PARENTAL ASSISTANCE AND SUPERVISION REQUIRED) Modernistic holders for tapers are made of hardwood scrap, 1 to 1 1/4 inches thick. Triangle, square, round, or free form are some of the possibilities. Use a brace and bit to bore a candle hole in the center of the blocks. A hole 1/2 inch in diameter is the right size for most tapers. Have holes stop within 1/4 inch of the bottom. Smooth the surfaces, polish with emery cloth or steel wool, and finish with a well-rubbed coat of paste wax. Rustic holders are made out of a log section about 2 1/2 inches in diameter, and two thumb-sized branches from the same sort of tree. White birch makes an attractive holder, but remember that the hark is quite flammable, so the candles will have to be watched and removed when within 1/2 inch or more of the end. Cut the log, sand the ends, and fasten small branches to the underside with nails. It will stand steady this way; now bore the candle holes in the top side of the log. Bore holes about one inch deep, and slightly larger in diameter than the candles to be used. Tiny, modernistic Christmas tree holders are 3 inches high, and are made of three triangles of soft wood, according to the patterns illustrated. Sand and then glue the sections together. 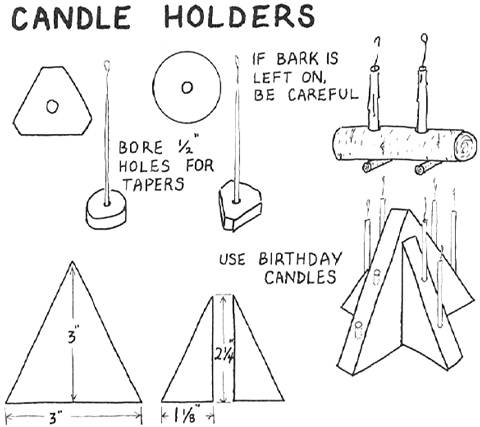 Use wood 3/4 inch thick, so that the candle holes can be drilled in the edges without slipping out the sides. Two holes are enough for each slope. Drill the holes 1/2 inch deep, and 1/4 inch or smaller for birthday-cake candles. The wood can be left the natural color, with a finish of well-rubbed paste wax; or paint the holder green and use bright red candles.